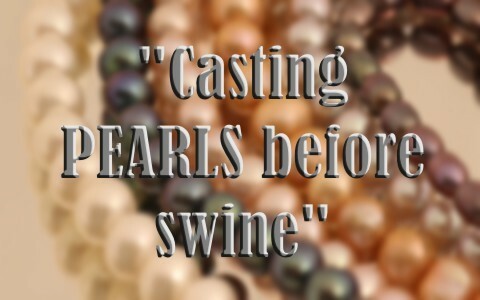 What Did Jesus Mean When Talking About “Casting Pearls Before Swine”? Jesus once talked about casting pearls before swine. What did He mean when He said this? What does it mean to us? Jesus once said that “the kingdom of heaven is like a merchant seeking beautiful pearls, who, when he had found one pearl of great price, went and sold all that he had and bought it” (Matt 13:45-46). I think what Jesus was saying here was that the kingdom of God is worth every earthly possession we have and then some. It is the most precious thing of all. To have eternal life by having your sins forgiven is indeed precious because in this, we can avoid being judged at the Great White Throne Judgment (Rev 20:12-15). At that time, all the wealth in the world won’t help you or me. This means the kingdom is worth more than all of the wealth that all of the planets of the universe contain and that we must seek the King of this kingdom first and foremost, above everything and everyone else (Matt 6:33). Is this the pearl that Jesus was talking about though when He said we’re not to cast our pearls before swine? What did He mean? Was He insulting those who would reject the gospel message of repenting and believing (Mark 1:15) since those who are unforgiven are considered unclean before God just as swine were in the Old Testament Mosaic laws? There may be some elements of truth to at least some of these observations as we shall see. In Matthew 7:6 Jesus said “Do not give what is holy to the dogs; nor cast your pearls before swine, lest they trample them under their feet, and turn and tear you in pieces.” Taken in the context within which it is given, and remembering that context is always critical to understanding the meaning of Scripture, this statement of Jesus came just after He spoke about not judging others when the person who is judging has something far worse in their life. Was this His response to those who were unfairly judging others when they themselves had far greater issues of sin in their life? This statement of Jesus not casting pearls before swine and not giving to the dogs what is holy comes between His statements of not being a hypocritical judge (Matt 7:5) and then about asking God for something in prayer. So Jesus’ statement in Matthew 7:6 seems to be in a context all of its own and should be taken as standing alone. The Jews often referred to their Roman occupiers, and indeed anyone outside of the Jewish nation, as dogs. Paul often spoke of “dogs” as even those Jews who rejected the true gospel and wanted to intermingle the Jewish laws with Christianity. This is clear in Philippians 3:2 where he says “Look out for the dogs, look out for the evildoers, look out for those who mutilate the flesh” which speaks of circumcision and the Jewish or Mosaic Laws, thus it appears that what we are not to give to the dogs are the precious truths of God because they won’t act upon them anyway. Jesus knew men’s hearts and knew who would believe and who would reject Him (Matt 9:4; Luke 9:47). The first part of Matthew 7 was about those who unfairly judged so maybe Jesus was saying that giving this message of not judging when the person is a hypocrite would only be like casting pearls before swine or giving what is holy (the gospel) to the dogs (who reject the gospel). Then this “pearl” (of the gospel) is wasted on casting it before the unregenerate and unrepentant “swine” because they’ll only “trample it under their feet.” This seems to fit what the author of Hebrews wrote about in 10:29 “How much worse punishment, do you think, will be deserved by the one who has trampled underfoot the Son of God, and has profaned the blood of the covenant by which he was sanctified, and has outraged the Spirit of grace.” When Jesus used the word “they” for “they will trample it under their feet” it seems to include both the dogs and the swine. Now, after they trample it under foot, then they turn on the one who cast it before them. We later see that the Jewish leaders who had long since been awaiting the Messiah turned on Jesus and tore Him to pieces…quite literally. Looking at the context of the entire New Testament then, we might see this pearl as being the precious gospel message and not just the plan of salvation but the Man of Salvation, Jesus Christ Himself. The “dogs” and the “swine” will not accept this message and not only that, they will not accept the Messenger, therefore it is wise to know when someone needs to hear the gospel or when it’s a lost cause and they’ll only turn on the messenger giving out the good news. Perhaps Jesus is telling us to try and discern when someone really wants to hear the hope that is found in the gospel or they just want to use it as a cause to turn and argue with the one giving it out. In my many years of experience of witnessing, I have found it a lost cause trying to argue people into heaven and there is no convincing someone who has already made up their mind. There is a point when it’s a waste of time and only makes matters worse. Sometimes people resist so strongly in hearing the gospel it makes them dig in their heels even deeper and we can do more harm than good. Jesus wants us to use wisdom in knowing when and with whom to share the gospel when and with whom not to. I would probably not be very effective if I went to an atheist’s convention and told them that they must repent and believe (Mark 1:15). I could only expect anger and argumentative responses. I would think it’s not wise to share the gospel with someone who is openly hostile and is only wanting an endless debate, but me, I would rather lose an argument and win a soul than win an argument and lose any possible hope of ever having someone see their need for the Savior. I’ve really learned this with my dealings on social media. Unfortunately I had got into several heated discussions that seemed, no matter what scripture or true account I gave, just went no where. A lot of times ending up with the person or persons I was in discussion with turning against me very vehemently. I prayed about this and the Lord had revealed to me about casting the pearls before swine. Now, even though I still get in some discussions, there is a point where I will no longer reply back. It’s pretty obvious that some people will not get it, at least at that moment. Thanks for putting out the article and I’ve missed your podcast for the last couple of weeks. Amen Mr. Reese. Unfortunately, I had to learn this the hard way but I know that no one was ever debated into heaven and sometimes it is best to walk away and all you can do is pray for them for only God can send His Spirit to show them their sins and thus, their need for Jesus as their Savior. Thank you for your kind words sir. The podcasts, as always, are free sir at: https://itunes.apple.com/us/podcast/ask-pastor-jack-podcast-what/id982631020?mt=2 Thank you for the encouragement my brother in Christ. Good to hear from you again and may God richly bless you Mr. Reese. and shall succeed in the thing for which I sent it”(Isa 55:11)? I have struggled(mild word) with atheists for years and have hoped that those listening to the discussion would be blessed and come to a knowledge of the Truth, even as my opponents railed with accusations against all we believe and hold Holy. “D. L. Moody made a covenant with God that he would witness for Christ to at least one person each day. One night, about ten o’clock, he realized that he had not yet witnessed; so he went out in to the street and spoke to a man standing by a lamppost, asking him, “Are you a Christian?” The man flew into a violent rage and threatened to knock Moody into the gutter. Later, that same man went to an elder in the church and complained that Moody was “doing more harm in Chicago than ten men were doing good.” The elder begged Moody to temper his zeal with knowledge. Three months later, Moody was awakened at the YMCA by a man knocking at the door. It was the man he had witnessed to. “I want to talk to you about my soul,” he said to Moody. He apologized for the way he had treated Moody and said that he had had no peace ever since that night on Lake Street when Moody witnessed to him. Moody led the man to Christ and he became a zealous worker in the Sunday school. Great historical accounts my friend. I think that we must realize that “there go we but by the grace of God” and we are not one wit better. We didn’t deserve His mercy and His grace. I would rather have someone respond in anger and hate that in apathy for in the latter, there is no hope; in the former, you’ve at least struck a nerve. Next post: What Is The Story Of The Talking Donkey In The Bible?